The international community has to step up its game to address marine plastic pollution head-on – not only through more voluntary and more effective measures but also through negotiating and implementing a legally binding treaty. Marine plastic pollution is a fast growing problem and it is not yet possible to estimate how severe the impacts currently are. Between 4.8 and 12.7 Mt of plastics ends up in the ocean each year, adding to the uncontrolled plastic waste already floating around the world’s seas. Despite many good initiatives and action plans, the world is about to lose the overall battle. There is an urgent need to vibrantly address the plastic pollution crisis of the oceans on a global level. This report by adelphi and Ecologic Institute provides suggestions in this regard. The report is available for download. A clear goal to stop further marine plastic pollution by prohibiting the discharge of plastic waste into the ocean from land- and sea-based sources. This would build on UNEA Resolution 3/7 outlining “the importance of long-term elimination of the discharge of litter and microplastics into the ocean”. Binding national plastic pollution reduction targets which address all sources and outline clearly the responsibilities of governments. The reduction targets should be connected to national plans for action, which should also address the responsibilities of business. A technical cooperation and financing mechanism, providing the means of implementation and technical assistance for adopting a range of tools on the regional, national, and local level, for instance supporting sustainable financing of waste management systems, by schemes based on extended producer responsibility, for example. A follow-up and review mechanism, as well as an enhanced science-policy interface, are needed for tracking progress towards objectives and targets and for continued observation of environmental conditions. The treaty should contain measures to assess conditions in the marine environment in order to monitor implementation of the treaty. A central forum for coordination and for establishing partnerships among governments and other stakeholders. The convention’s decision-making body and other platforms would also bring actors from the various existing platforms and frameworks together to develop programmes and make use of synergies to address the full life-cycle of plastics. Simon, Nils; Knoblauch, Doris; Mederake, Linda; McGlade, Katriona; Schulte, Maro Luisa; Masali, Supriya (2018): No More Plastics in the Ocean. 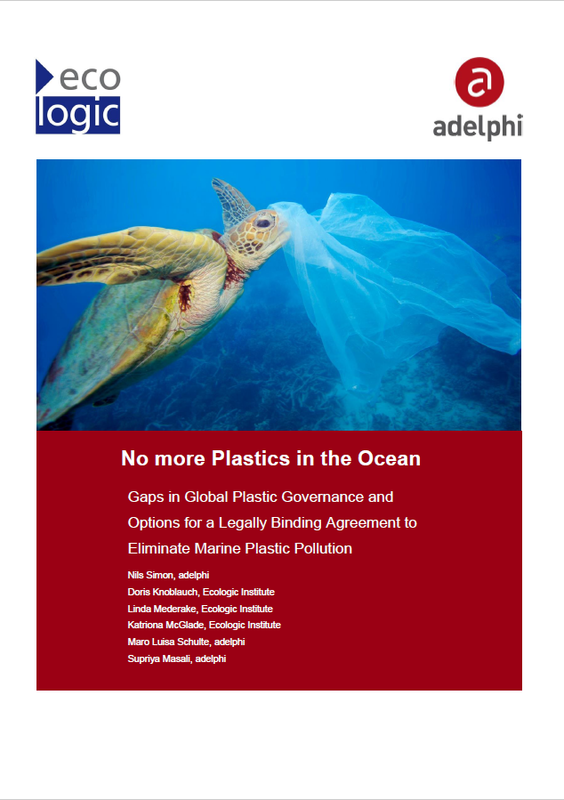 Gaps in Global Plastic Governance and Options for a Legally Binding Agreement to Eliminate Marine Plastic Pollution. Draft report for WWF to support discussions at the Ad Hoc Open-ended Expert Group on Marine Litter and Microplastics. Berlin: adelphi.